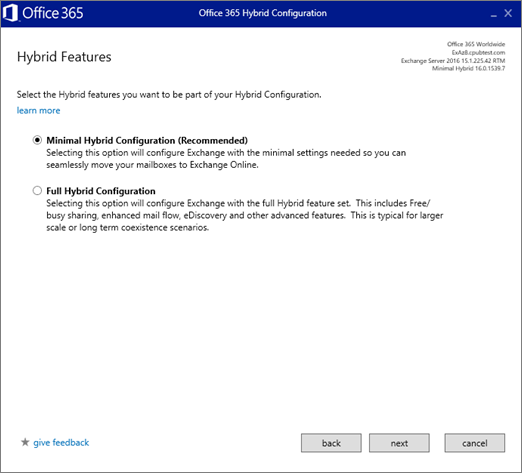 You can use the minimal hybrid, also known as express migration, option in the Exchange Hybrid Configuration Wizard to migrate the contents of user mailboxes to Office 365 over a course of couple of weeks or less. Are running at least one Exchange 2010, Exchange 2013, and/or Exchange 2016 server on-premises. Plan to move to Exchange Online over a course of few weeks or less. Do not plan to continue to run directory synchronization to manage your users. During the migration, the Simple Mail Transfer Protocol (SMTP) address of each on-premises mailbox is used to create the email address for a new Office 365 mailbox. To run an express migration, the on-premises domain must be a verified domain in your Office 365 organization. You can also find the instructions in Create DNS records at any DNS hosting provider for Office 365. Do not continue to the next step in the domains wizard. You now have verified that you own the on-premises Exchange organization domain and are ready to continue with an email migration. You will finish setting up your domain after the migrations are complete. 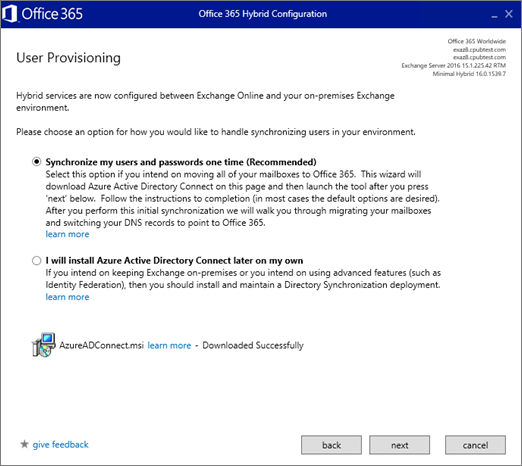 On a computer that is domain joined to your on-premises organization, sign in to your Office 365 account by using your global admin credentials, and start the Exchange Hybrid Configuration Wizard on the Data migration page of the Office 365 admin page. In the Office 365 Admin center, go to Setup > Data migration. Migration page, under Select your data service, choose Exchange. On the first Hybrid Configuration Wizard page, choose next and on the On-premises Exchange Server Organization page, accept the default values and choose next. By default the wizard connects to the Exchange server running the latest version. 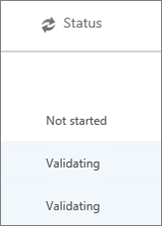 On the Credentials page, choose Use current Windows credentials for on-premises Exchange server, and enter admin credentials for it and your Office 365 tenant choose next, and then choose next again once the connections and credentials have validated. On the Hybrid Features page, select Minimal Hybrid Configuration > next. On the Ready for Update page, choose update to prepare the on-premises mailboxes for migration. On the User Provisioning page, select Synchronize my users and passwords one time. At this point you are prompted to download and install the Azure AD Connect wizard to synchronize your users from on-premises to Office 365. 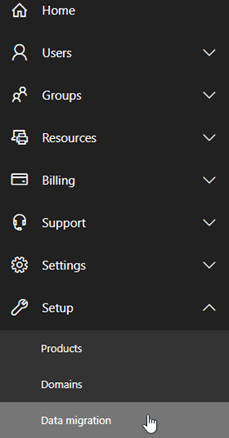 Once Azure AD Connect has downloaded, run it and choose the default options for Express settings. After synchronization is completed, you will be taken to the Office 365 Data migration page where you can see all of your users that were synchronized to Office 365. After the one-time synchronization is done, directory synchronization is turned off for your Office 365 tenant. After Azure AD connect synchronizes your users and their passwords to Office 365, you have to assign Office 365 licenses them so that they have a cloud mailbox to which to migrate their on-premises mailbox data. The status on the Data migration page indicates that a license is needed as shown in the figure. In the Admin center, go to Users > Active users and follow these instructions to Assign licenses to users in Office 365 for business. After you assign licences to your users you can go to the Data migration page to start migrating their mailboxes. 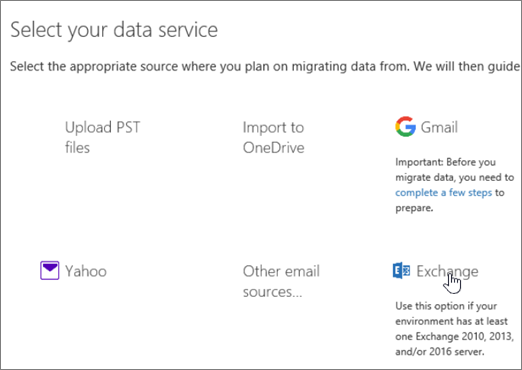 Go to Setup > Data migration, and on the Migration page choose Exchange for your data service. On the Data migration page, select the users whose mailboxes you want to migrate and then choose Start migration. It is recommended that you migrate mailboxes for two or three users as a test before migrating all of your users to make sure everything works as expected. The Data migration page will display the migration status as it progresses. For a full list, see Migration users status report, which you can also view in the Exchange admin center. Email systems use a DNS record called an MX record to figure out where to deliver emails. During the email migration process, your MX record was pointing to your on-premises Exchange email system. Now that the email migration to Office 365 is complete, it's time to point your MX record at Office 365. You will also need to finish setting up your DNS records. In the Office 365 Admin center go to Settings > Domains and then choose the domain name you want to update, for example contoso.com. The domains wizard will guide you through the update steps. See this article for instructions specific to your registrar or host: Create DNS records at any DNS hosting provider for Office 365.